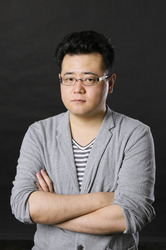 Naokatsu Tsuda is a Japanese animation director at David Production Inc. After making his debut as a chief director for "Inu x Boku Secret Service" (2012), Tsuda is now best known as the director of the TV animation "Jojo's Bizarre Adventure" series (2012-2016). Jojo series has been popular for over 30 years, ever since its original manga by Hirohiko Araki was first issued in Shueisha's Shukan Shonen Jump comic magazine. Tsuda succeeded creating the perfect visualization of the unique "Jojo World" that even the critical core fans admire. Without limiting his specialized genre, Tsuda's animation making covers various types of titles such as "B Gata H Kei" (2010), "LEVEL E" (2011), "Ben-to" (2011), "Chojigen Game Neptune" (2013) and the latest "Jojo" series made a record-breaking hit to be called as his new masterpiece. For more information on David Production Inc. visit http://davidproduction.jp/english/.